Sciatica is a term that describes symptoms of severe “burning” type pain, numbness, and/or weakness that radiates along the sciatic nerve from the lower back to the buttocks and leg. The medical term for sciatica is lumbar radiculopathy. The majority of sciatica symptoms result from lower back disorders between the L4 and S1 vertebral levels that put pressure on or cause irritation to a lumbar nerve root. Sciatica is most commonly caused by a disc problem, such as a disc herniation (or bulging disc) but can also be caused by other inflammatory processes in the lumbar spine. Sciatica affects people in different ways. The most important symptoms are single-sided SEVERE leg pain, numbness and weakness, radiating down the back of the thigh and into the foot. 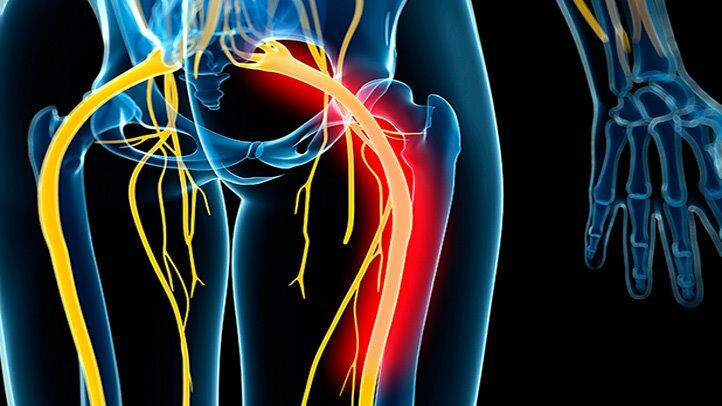 The diagnosis of sciatica and its management varies considerably within individuals, hence why it is important for our practitioners to assess accordingly to assign the most suitable treatment plan for best outcomes and management of symptoms. If you believe you have related symptoms of this sort. Please advise our reception staff to book in a one-on-one session to allow our allied health practitioners (both Physiotherapists & Accredited Exercise Physiologists) to thoroughly assess, diagnose and treat accordingly. BERGSMAN, A., REIS, G., & SAHLGREN, E. (2009). Diagnosis and Treatment of Sciatica Based on a Follow-up Study. Acta Medica Scandinavica, 144(1), 71-78: 10.1111 – 15665.